Sometimes, we build little features in that aren't worthy of their own page. Said features are ones we're super-proud of, and may be a little subtle and hard to discover naturally. This page has been built to give you all of those little golden nuggets in one place. Grab your akubra, sunscreen, pan and pick. There's gold in them there hills!!! Everybody knows the standard way to add someone to the system who isn't in the member register. If you're new to Majestri, it's on the People and Groups tab. You can't miss it. 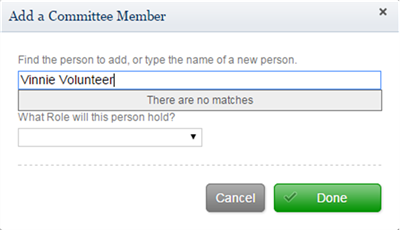 It's always been a little bit painful when you're building a committee or a custom group and always having to return to that tab. So we decided to do something about it. Check out how cool this is. 1. 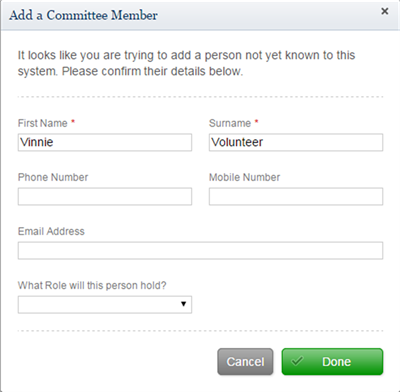 So you want to add a new volunteer to your committee, and after typing their name, you realise they're not in the system. 2. When the screen looks like it does above, just hit Enter. We'll work out the name and create a new record based on what you typed in. You should see the next screen below. 3. Fill in whatever else you know and hit Done. Now, we ask you; how good does that feel? So you've got some web pages that you only want to be accessible to your members. It doesn't seem like Majestri has a way to do that. There is a way to do that, but we've got to be upfront. There's no nice screen or anything like that. In fact, the industry term for this feature is "HACK!". Still, it's effective, and you can use it. When you've got a web page in design mode, locate the grey tag at the top right of the screen that contains the name of the page you're currently editing. There'll be an "edit" link just to the right. Click the link. Change the name of the page so that it starts with the text "Member_Res" (don't forget the underscore), and hit Done. All of a sudden, that page is accessible through everybody's My Details screen. It'll appear as a link on the right. What it essentially means is that only somebody who logs into the system will see that page and know it exists.